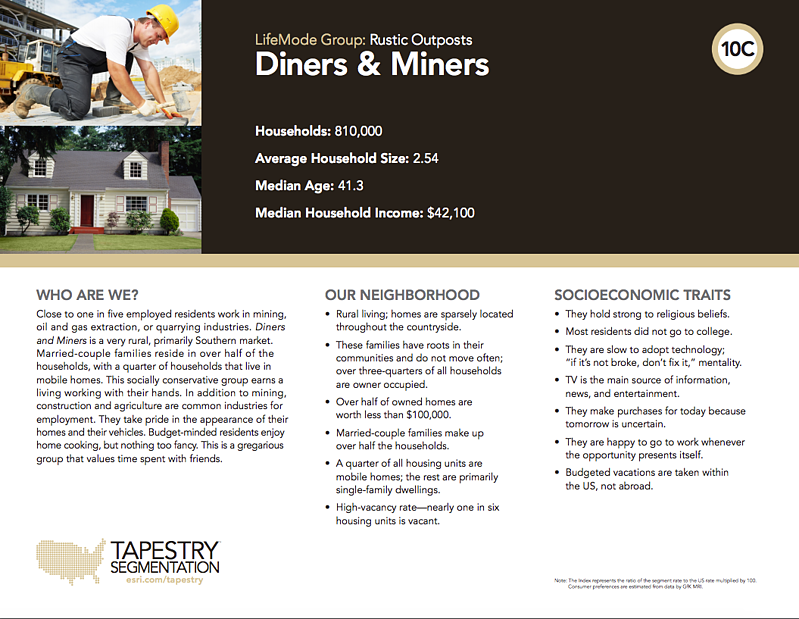 The Rustic Outposts Lifemode is made up of five Tapestry Segments: 10A - Southern Satillites, 10B - Rooted Rural, 10C - Diners & Miners, 10D - Down the Road, and 10E - Rural Bypasses. 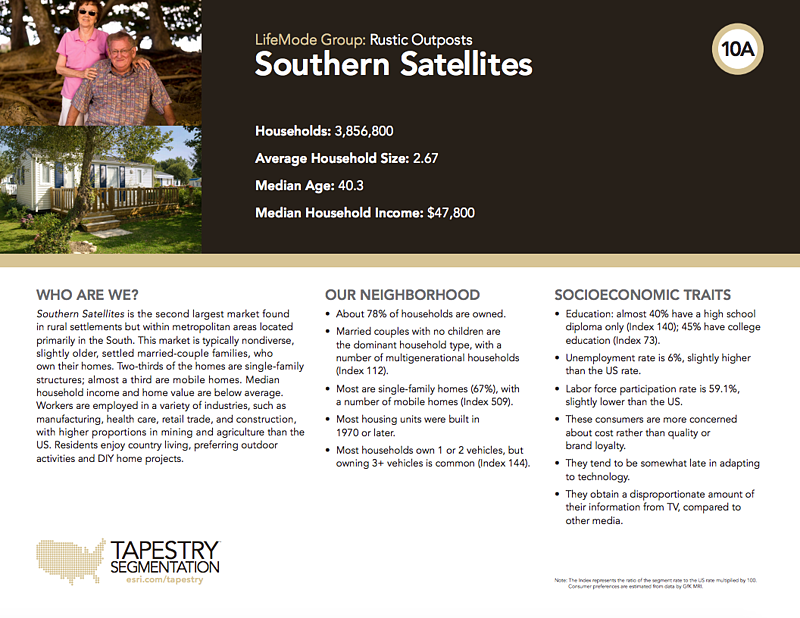 Rustic Outposts’ Households tend to be between 28-35 years old, live in single family houses or mobile homes, are White, have median HH incomes between $29,000-$44,000, and stopped schooling after high school graduation. 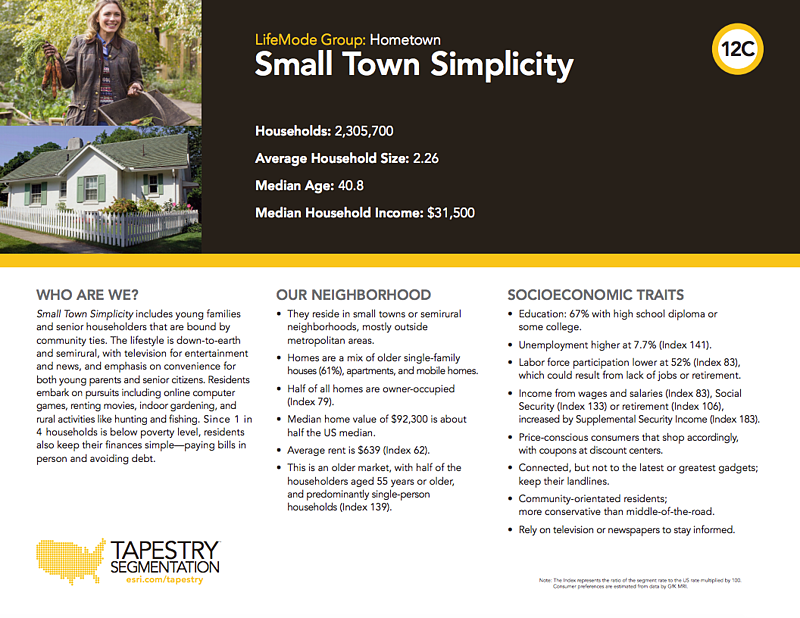 This Lifemode is made up of four individual Tapestry Segments: 12A - Family Foundations, 12B - Traditional Living, 12C - Small Town Simplicity, and 12D - Modest Income Homes. 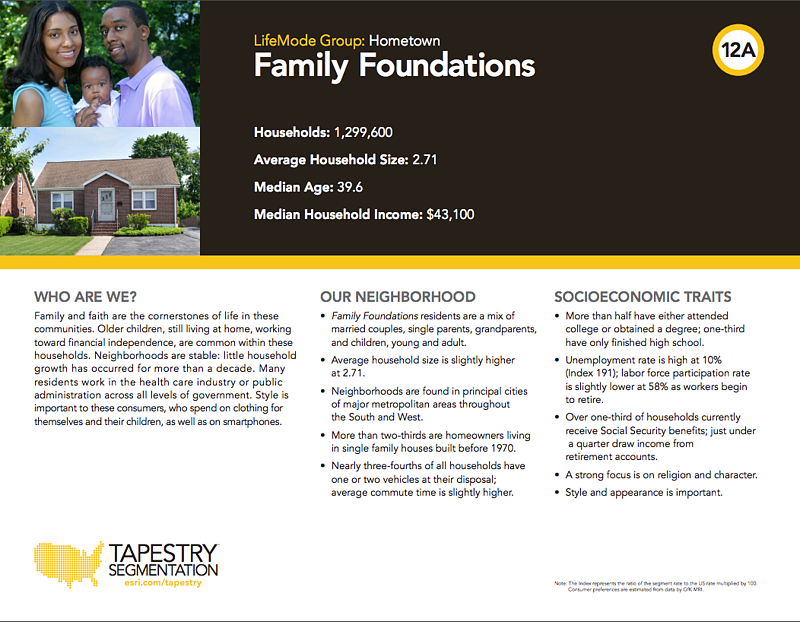 Households in the Hometown LifeMode tend to be 35-40 years old, live in single family houses, are Black and White, have median HH incomes between $22,000-$40,000, and stopped schooling after their high school graduation. 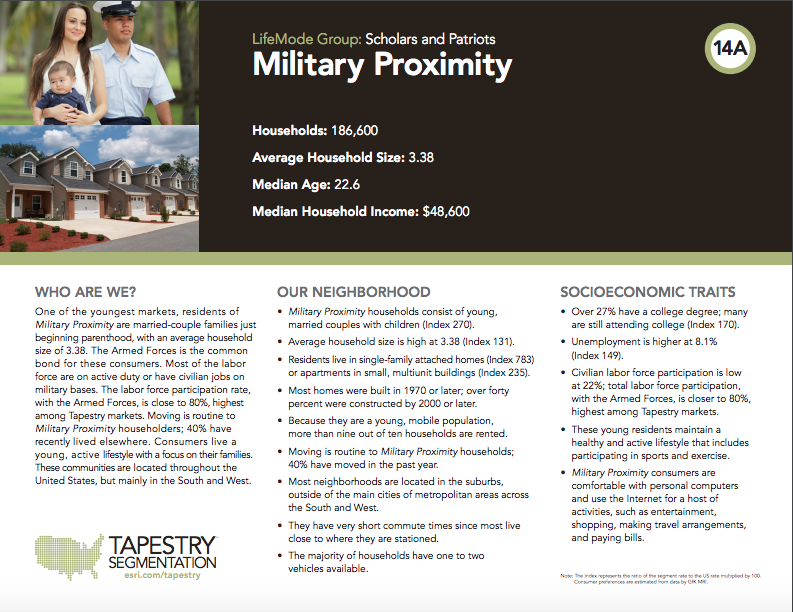 The Scholars and Patriots LifeMode is made up of three Tapestry Segments that account for those in college and those that serve in any of America’s military branches: 14A - Military Proximity, 14B - College Towns, and 14C - Dorms to Diplomas. 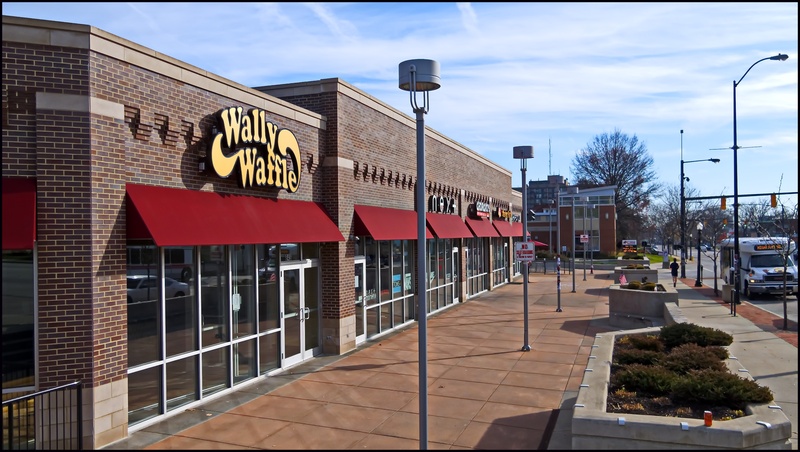 Households in this LifeMode are 21-25 years old, live in multiunit housing and apartments, tend to be White, have median HH incomes between $18,000-$43,000, and have taken some college classes or recently graduated from college. 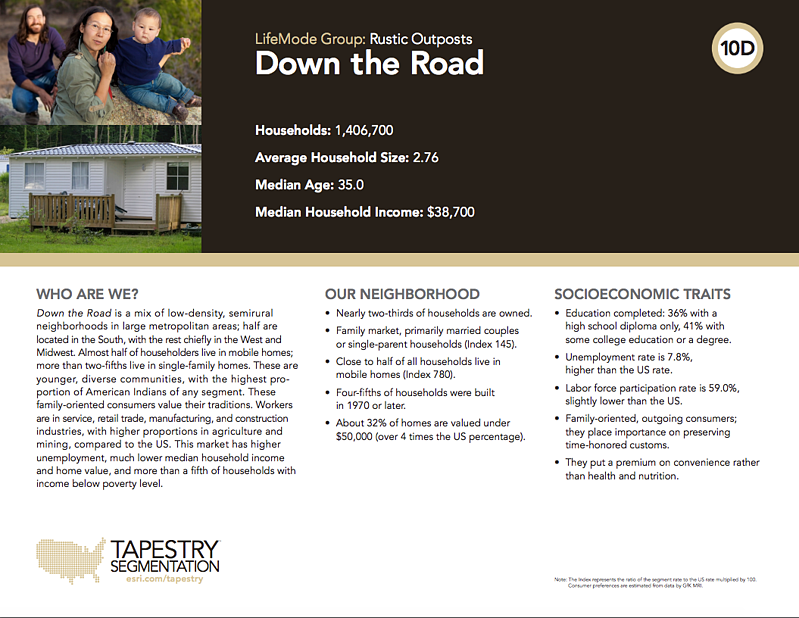 Throughout this series on Tapestry data, we’ve broken out the various Tapestry Segments by LifeMode and uncovered what the population that falls into each segment does, where they live, and what drives them. With a more in-depth understanding of each segment, we hope that you now feel better equipped to serve your existing patient populations and expand your reach within your markets. As a reminder, if you missed any of the previous posts in this series, you can read the first, second, third, fourth, and fifth posts here. 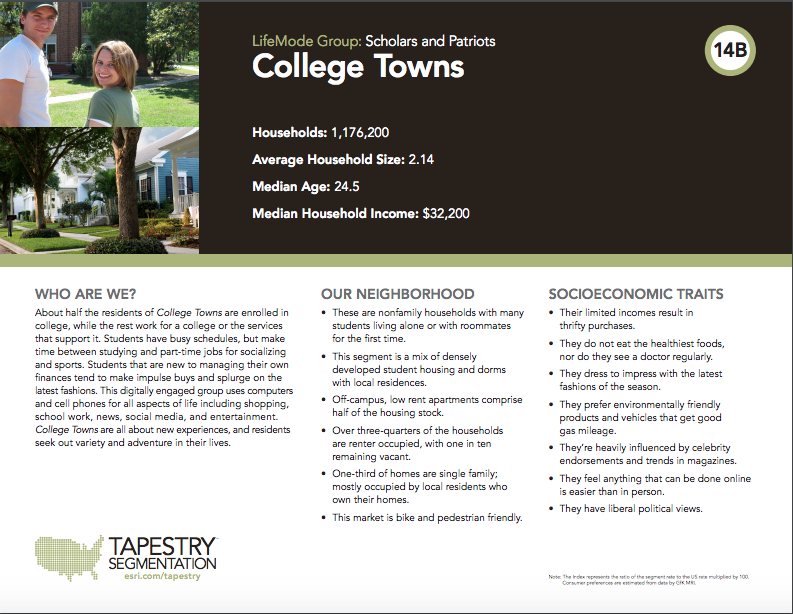 Since Tapestry Segmentation is so diverse and can be quite different depending on what part of the country you are in, we’ve broken out the segments within the many LifeModes over the course of this series. 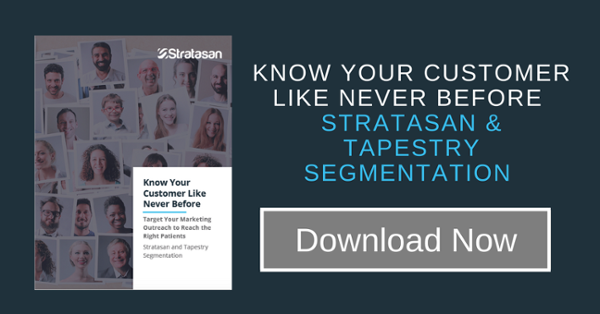 Now that we’ve reached the end, you should be able to identify and interpret the Tapestry Segments in your market and coordinate your strategy and/or marketing outreach accordingly.